According to the well-known adage, nothing is certain in life except for death and taxes. When it comes to the world of investments, taxes are inevitable. These could include Income Tax, Capital Gains Tax, VAT or indeed Inheritance Tax. 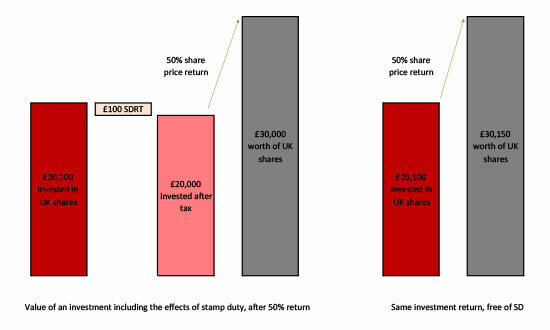 However, a lesser known – and perhaps overlooked – revenue stream for the Government is a transaction tax on UK equity investments, referred to as ‘Stamp Duty Reserve Tax’ (SDRT) if shares are purchased electronically, or simply ‘Stamp Duty’ when purchases are undertaken in certificated form. For ease we will use the terms interchangeably. Typically this tax is 0.5% of the value of any purchases of UK-listed shares. As with any tax there are a number of exemptions, quirks and nuances; for example, any company forming part of AIM (Alternative Investment Markets) is free from SDRT, as are purchases of less than £1,000 that are undertaken non-electronically. However, in general most UK shares are included. When making a purchase of £20,000 worth of Vodafone shares, SDRT of £100 is payable, bringing the total cost of the transaction to £20,100. For a long-term investor this can make a big difference. If over the next decade Vodafone shares returned 50%, the gap in the value of the investment if Stamp Duty was not paid grows to £150. The graphic below highlights how the effects of paying SDRT can erode capital growth over the longer term. For an investor directly investing in UK shares, the tax is paid on purchase. It is also usually paid by investors in a UK equity fund, although in this case indirectly. When the manager of the fund invests the inflow into shares, they are subject to SDRT. This is then passed on to the investor through a dilution levy or, if this is not the policy of the fund, it is borne by all the investors in the fund. This is also the case for UK index tracking funds. As passive funds look to minimise the tracking against the benchmark, they almost always pass SDRT straight to the investor through a mechanism such as a dilution levy. For a passive investor, achieving a return that matches the index is the primary objective. As benchmarks such as the FTSE 100 don’t include SDRT in their calculations, using a tracker fund makes it harder to achieve the same return as the index after fees and charges. However, index tracker funds aren’t the only way to invest passively. Although not widely adopted by the UK adviser and retail markets, ETFs offer an alternative way to track indices. While the underlying index that a tracker fund or ETF tracks is often the same, there are distinctions between the two structures. The most often cited difference is the ability to trade ETFs intraday. This mechanism of trading intraday is facilitated by investors trading directly between each other rather than directly investing in the fund. Because of this mechanism, no UK shares have to be bought by the ETF fund manager, as rather than receiving an inflow into the ETF, the transaction has occurred independently of the ETF. This is called secondary trading. ETF trades themselves are exempt from Stamp Duty in most jurisdictions, including the UK. This means that the secondary trade in the ETF is essentially exempt from Stamp Duty. It is important to note that an ETF does trade at a slight premium or discount to the underlying asset value to prevent arbitrage opportunities from this tax advantage, but in normal market conditions the premium or discount is fairly steady, meaning an ETF can be sold at the same premium or discount it was purchased at. UK equity ETFs tend to trade at a slight premium to account for SDRT, but can also very likely be sold at this premium later, effectively meaning that whilst SDRT is temporarily suffered on purchase due to the premium, it is in effect recouped by the investor on selling the holding, due to the persistent premium. Often, when reporting the performance of an ETF or an index tracker fund, simply the change in the net asset value is reported, with the effects of trading costs and taxes often excluded. Therefore an investor may be unaware of the taxes they are paying. When putting together our passive funds and MPS we try to consider the overall net return an investor will receive, rather than a ‘paper return’ of a theoretical portfolio. Alongside SDRT in the UK, transaction-based taxes are incurred across the globe. We therefore use ETFs in our products where possible due to the advantage gained from transaction taxes over index tracker funds (alongside a number of other reasons), and conduct most of our trades on the secondary market. When choosing where to invest passively, it is therefore important to consider all taxes and charges, and not just the headline OCF of a passive portfolio. Sometimes this may lead to a higher OCF, but a better net return for the investor. Matt is responsible for the day-to-day running of the AJ Bell Passive funds, working with our investment team to further grow the range of investment options. He joined us with over six years’ experience in financial services, having previously worked at a leading provider of wealth management services as a Senior Fund Manager and Head of Fixed Income Research, with specific responsibility for managing a discretionary fixed income fund. He also formed part of a four-person fund management team that ran the company’s multi-asset funds. Matt graduated from the University of York with a first class Masters degree in Mathematics, and is a CFA Charter holder.